On July 9, 2016, Cliff was driving a 2009 Toyota (owned by a friend) early in the morning with three other passengers. While driving north on Barnes Avenue, a 2012 BMW failed to stop at a stop sign and drove into the driver’s side of the car he was driving. The impact pushed Cliff’s car into a parked car and the airbags deployed in both vehicles. The dashboard (front of the car) was pushed in, and Cliff’s foot was pinned. While Cliff was stuck in the car, the other driver asked Cliff not to call the police because she did not have a driver’s license! Cliff feared that the other driver would try to leave, but thankfully, her car was not drivable. Although reluctant at first, the other driver finally called the police and the FDNY used the jaws of life to extract Cliff from the car. Cliff was taken to Jacobi Hospital by ambulance where he had x-rays done and was discharged with pain medication. Due to the incident, Cliff suffered injuries to the left side of his body as well as his head. He complained of neck pain radiating to the left shoulder, left shoulder pain, left wrist pain and left hip pain. Cliff underwent surgery for his left shoulder on April 27, 2017. In addition to the left shoulder surgery, Cliff was diagnosed with cervical derangement with bulges and herniations with radiculopathy that required 3 pain management injections. For several months, he attended physical therapy 3 times per week. To make matters worse, the vehicle that Cliff was driving (remember it was owned by his friend?) was not insured! Even though the car was not his, MVAIC (Motor Vehicle Accident Indemnification Corporation) sued Cliff for $42,000 for being the driver of a vehicle that lacked proper coverage to help pay the medical bills of those injured in the accident. Cliff heard Adam Handler’s radio show and decided to give our team at Pollack, Pollack, Isaac & DeCicco, LLP a call! The BMW’s insurance company offered the maximum compensation of $100,000 that was divided between Cliff and three passengers ($25,000 each). Since we could not obtain additional compensation from the vehicle he was driving (uninsured / no UIM coverage), our team successfully recovered an additional $25,000 through Cliff’s home insurance policy! 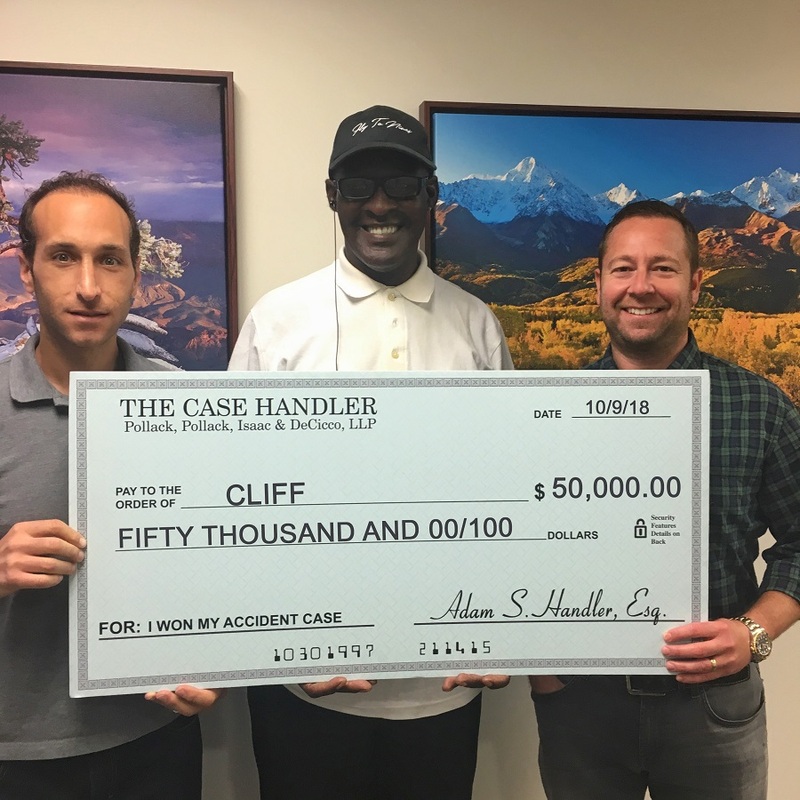 With the help of our skilled Bronx MVA attorneys, we were able to drastically lower MVAIC’s $42,000 lawsuit down to $1,500 and recover $50,000 in total compensation for Cliff! How in the world can an innocent driver (or passenger) find themselves not only injured, but also facing a lawsuit? As unfair as it sounds, it happens. Cliff had no idea that the car he was driving was uninsured and he learned the hard way to never drive another car that doesn’t have auto insurance. That is a good reminder for us all to never get behind the wheel of a vehicle unless the car is insured. If you or a loved one were injured in a car accident in New York, make sure to get the legal guidance you deserve from a stellar legal team that “will fight till the end” for you.